Trains and boats and planes are the way to spell Bray. The first two are obvious, historical. This is a seaside resort for two centuries, and a railway town since 1854. The planes have been a feature for just the last twelve years. Each July, as the Summer Festival kicks off, the skies above the Esplanade are fractured by shrieking jets, aerobatic aeronauts, army paratroopers and a parade of winged history to satisfy the most demanding planespotter. And everyone else besides. The Air Show attracts crowds of around a hundred thousand, three times the population of the town itself. Given a sunny summer day, the seafront is thronged anyway. On this weekend it is bursting with human life. As one would wish, the morning’s drizzling clouds have lifted to reveal a perfectly blue heaven. The town centre empties towards the beach. With traffic restrictions its emptier still. Motorists clog the periphery. I pass the library, an oasis of silence (for a change), just as the first planes thunder above the railway station. The day is in full swing. The annual carnival has colonised the north esplanade. Food markets and other mobile displays throng the south. The ice-cream parlours, the chippers and cafes are having a field day. All along Strand Road, the bars are packed. Bray’s seaside bars offer the unique pleasure of extensive outdoor terracing, giving the chance to wine and dine al fresco with stunning views of the sea and headland. And of course, the sky. The Porterhouse, Martello and Jim Doyle’s, with its Rugger posts, are central to the seafront. Meanwhile, Butler and Barry’s above the Sealife Centre is in the position of control tower. 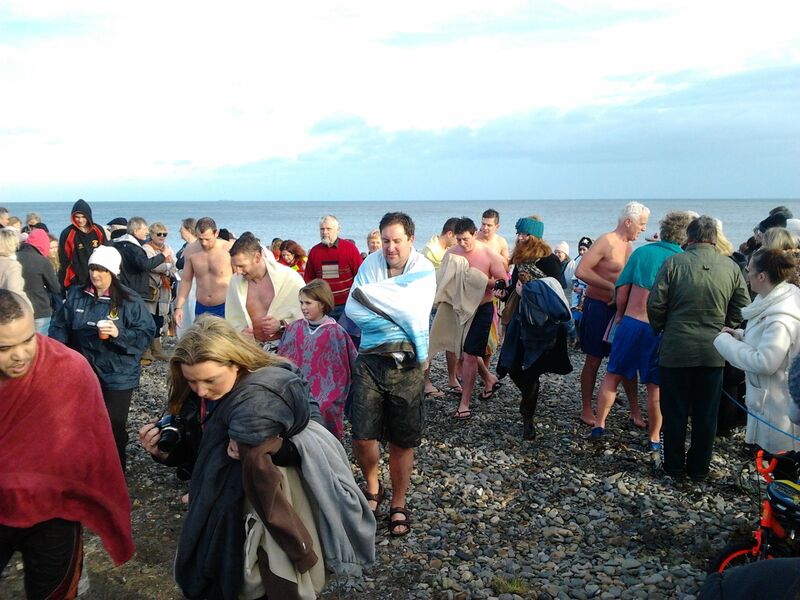 A carpet of spectators stretches along the beach and Esplanade, a river of people stretching up to the Cross on the Head. Around the corner, the Harbour is practically serene. The Harbour Bar dates from 1831. In those days it stood over a smaller dock. Today, it’s a port of call for musicians, artists, hipsters and dart players, for all who hunger and thirst, perhaps the odd pirate and desperado too. The tail end of the display sends a few flyers down here. I’m coming in to land. The M50 loops around Dublin city’s western perimeter. Technically, it starts at the River Liffey, heading north as the Port Tunnel before doubling back along the western arc near the Airport, crossing the Liffey at Chapelizod and finally merging with the southern bound N11 at the Dargle River, near Bray. This is EuroRoute 1, heading to Wexford and thence the Continent, bound for Gibraltar. The construction of the motorway began thirty years ago. The first section, the Western Parkway joined Blanchardstown and Tallaght, crossing the Liffey at the West-Link bridge. The West-Link floats above the Strawberry Beds, a stretch of deep river valley between Chapelizod and Lucan. The area is famed in song and story. You’ll kiss away the worries from my brow. This well known refrain is from the song The Ferryman, written by Pete St. John. It has been covered by the Dubliners and the Dublin City Ramblers. The Strawberry Beds itself sustains the folk and ballad tradition with pubs such as The Anglers’ Rest, The Wren’s Nest and Strawberry Hall. The area was a popular spot for Dublin daytrippers and courting couples. A century or more ago it was sufficiently remote and romantic to be a popular honeymoon destination. James Joyce is associated with it, of course. From Chapppelizod he liked to contemplate the Liffey. Finnegans Wake focusses on the rivers gathering flow hereabouts, its principal characters living in the Mullingar House. Plain structure that it is, it has been a long-time sentinel above the river, founded as a coach house back in 1694. Sheridan Le Fanu lived here, merging the parkland and built environment with the gothic of his ghostly tails. The House by the Churchyard where he lived, his father was a vicar, still remains. It provides the title and central focus of one of his most celebrated novels. By the eighteenth century there were suggestions of suburbia here on the fringe of Dublin. Heading westward along the Liffey’s banks, they are still only suggestions.The area is a rare slice of unspoilt rural scenery close to Dublin. The Phoenix Park is to the North. Beyond the south bank the twentieth century suburban sprawl of Ballyfermot and Palmerstown is hidden in the folds and forests of topography. There are a number of boatclubs along the way, taking advantage of the ninterrupted stretch of river. The area is not much commercialised, emphasising the impression that time has passed it by. The contemporary world does provide an exclamation mark with the intrusion of the West-Link bridge. Soaring above the quiet valley, far enough above to be of little disturbance, no more than a distant aircraft. Originally a slim, single span on completion in 1990, such was the volume of traffic that a second span was added in 2003. Beyond the bridge, the valley snakes towards Lucan. This far west, we’re nearly in Kildare. Though Lucan may be regarded as a Dublin suburb, it is sufficiently old and remote to be viewed as a town in its own right. Some old industrial sites emerge from the parkland before the river vista expands at the bridge. A huge weir provides the spectacle upriver, and there is a small park giving better access to the river. Much of the town’s structure dates to the early nineteenth century. It was once a spa town and despite the heavy human and vehicular traffic, the population is around thirty thousand, it retains a certain olde world charm replete with village green and thatched pub. Looping back to the M50, the Dublin Mountains edge closer. The Red Cow junction was once called the Mad Cow such was the traffic chaos. Brian Boru, High King and attempted nemesis of the Danes parked nearby in his eleventh century campaigns agains Leinster and Dublin. The arc of the M50 still provides a notional border between the realms of Dublin and Ancient Hibernia. Of course, urban sprawl crosses the divide. Lucan, Clondalkin and Tallaght all lie to the west. The Southern Cross section reached Dundrum in 2002, while the final South Eastern section linked up with Bray three years later. The whole shebang was upgraded to six lanes in 2010, as it was in danger of becoming a linear carpark. You’ll still encounter jams at morning and evening rush hour but for the most part journey times have been slashed and the route is visually attractive, especially towards the south. Crossing the Dargle River it merges with the M11 and enters County Wicklow. The Dargle is referred to in another well-known balled, The Waxies‘ Dargle. This alludes to Bray’s position as a resort for the well-to-do in Victorian days. The railway from the 1850s provided access for the quality to Bray’s renowned sea and riverside amenities. Meanwhile, the Waxies‘ Dargle was the poorman’s equivalent. The waxies were cobblers, and these and other tradesmen could hardly aspire to such exotic locale as Bray. A jaunting car or charabanc to Irishtown, where a fairgreen faced the bay, was as much as they could hope for. will you come to the wakies dargle. sure I haven’t got a farthing. These days, the M50 will take you around the western periphery by private car. You can trace the eastern edge of the city, along Dublin Bay by DART. You can stop for refreshments, for ceol and craic, wherever you desire. Bray – a Short History. Bray is a direct translation from the Irish ‘Bré’, meaning a hill. For some time, however, the Irish version was given as Brí Chualainn whose meaning is disputed. In general it is taken to derive from Ui Bhriain Chualainn, the land of the O’Byrne’s of Cuala. The O’Byrnes, usually styled Byrne, are a significant Wicklow name, along with Cullen, O’Toole and Kavanagh. These clans disputed coastal Wicklow with the Danes and subsequently the Normans. There are some remnants from the early Christian era, dating from the fifth century onwards. The ruins of Raheen a Chluig, the Little Church of the Bell, are on the lower, northern slopes of Bray Head. Two well-weathered early Christian crosses survive, at Fassaroe to the north, and Fairyhill to the south. This latter cross, situated in a hilltop stand of fir trees at the entrance to a modern estate, is attributed to Saint Saran. The saint is further commemorated in the name of nearby Killarney Road, the southwestern approach road to the town. Bray, as a definite location was established by the Normans under Richard de Clare (Strongbow), at the fording point of the River Dargle near where the town bridge now stands. The location was of importance since it marked the southern extent of the Pale, the area of Norman influence around Dublin. As such, Bray was a frontier fortress, sporadically attacked by native clans from the south. The castle was built just west of where St Peter’s church stands. Other castles, or tower houses, were established at Castle Street north of the Dargle, and Oldcourt further south. Only the ruins of Oldcourt Castle remain. The lands south of Bray were granted to Walter de Riddlesford, one of Strongbow’s loyal adventurers in the invasion of 1169. This led to the establishment a large demesne centred on Kilruddery, the Church of the Knight. The route between this estate and Bray Castle established the line of Main Street. Thus, Bray grew as a typical manor town of the era. Agricultural produce, milling, brewing and a freshwater fisheries maintained the economy of the town over the next few centuries. The Brabazon family had come into ownership of the estate in the early 16th century through William Brabazon, Lord Justice of Ireland. Brabazon gained favour through his zealous support for Henry VIII as King and head of the Irish church. The title Earl of Meath was granted to his great-grandson William in 1623. 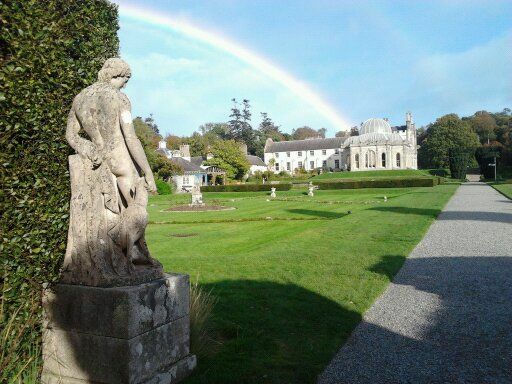 Kilruddery House had to be rebuilt following destruction in the Cromwellian wars of the mid century. The current building is largely an 1820s reconstruction in the gothic Tudor revival style. The original gardens remain, designed by the French gardener Bonet, they are a unique example in Ireland of eighteenth century design. An eerie, placid beauty attaches to them, the most notable vista is presented by the parallel canals running south of the house. Adjacent to this gothic realm, classically inspired additions were added in the eighteenth and nineteenth centuries. By the end of the eighteenth century, Bray’s development as a resort had begun. The Romantic movement inspired people to regard the sea as beneficial to health, of body and of spirit. Contemplation of beautiful scenery and engagement with nature was also encouraged. Bray was ideally situated, close to these benefits and also convenient to Dublin. Novara House, an early beach lodge, lying at the southern end of Novara Avenue, dates from this time, though it has been extensively modernised. 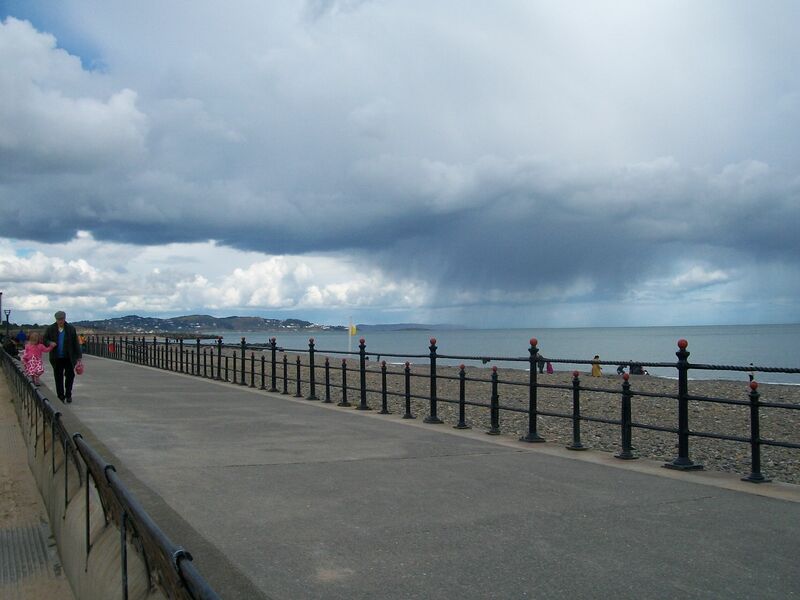 Originally known as Bay View, it is sited a half mile inland from the seafront itself. The early nineteenth century saw the building of three Martello Towers to guard against the Napoleonic threat. One of these survives on the crag overlooking the harbour at the north end of the seafront. In the 1980s this became, for a time, the residence of that other wee general, Bono of U2. The harbour itself would not be constructed until the second half of the century, such sea traffic as there was unloading at a small dock at the mouth of the Dargle opposite the Harbour Bar. This popular, atmospheric pub from the 1840s is one of the few buildings on the seafront to predate the coming of the railway. The railway transformed Bray. The Dublin-Kingstown (now Dun Laoghaire) was opened in 1834, however, twenty years passed before it was extended to Bray. Railway engineer and developer William Dargan, was instrumental both in bringing the railway to Bray and in developing the town into a major attraction for visitors and new residents. The area between Main Street and the seafront was developed with straight, tree-lined avenues lined with elegant Victorian terraces. Dargan had an exotic Turkish Baths constructed in the Moorish style on Quinsboro Road. It was a startling addition to Bray’s streetscape for over a century before its sad demise in the 1970s. Another of Dargan’s initiatives was the National Gallery of Ireland facing Merrion Square in Dublin. A statue of the indefatigable entrepreneur and patron stands in its forecourt. In Bray, he is commemorated in the name of a terrace on Quinsborro Road, and in a mural at Bray Dart station. Major hotels were established to cater for the influx of tourists and day-trippers. Quin’s Hotel, overlooking the Dargle at the north end of Main Street was transformed from a small town inn. It is now the Royal Hotel and Leisure Centre. Other hotels sprang up on the seafront and adjacent to the railway station. 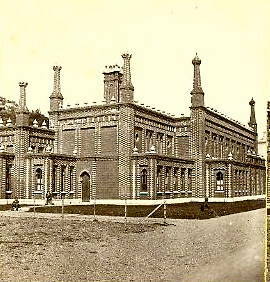 The International Hotel, facing the station’s west frontage, was the largest hotel in Ireland on its completion in the 1860s. The development of the Esplanade with its seawall Promenade, and the Harbour came soon after. Bray, once the small manorial village, was transformed into a thriving resort for the quality, and dubbed the Brighton of Ireland. By the end of the century, the town’s population approached the ten thousand mark, whereas most Irish towns, in the aftermath of the Famine, showed declining populations. During the Edwardian era, Bray continued to epitomise the stylish resort. After Irish independence, it began to drift downmarket. Fashions change, and holiday resorts now catered for a more egalatarian population. Amusement arcades mushroomed, an increasingly raucous brand of fun was demanded. Big band music, cinema, donkey rides were all part of summer at the seaside. Blackpool of Ireland, might have been more appropriate as a nickname. After the hiatus of World War Two, British holidaymakers returned in the fifties. 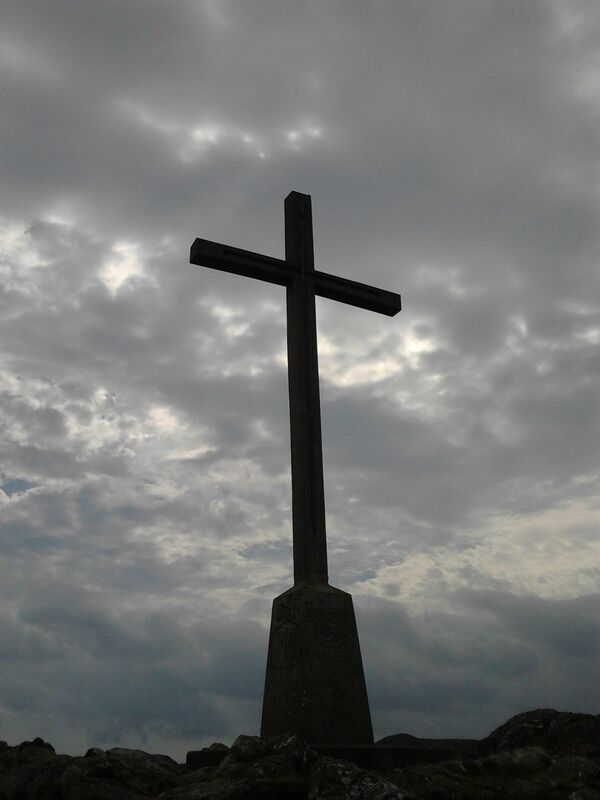 Bray Head acquired its crowning stone cross in the Holy Year of 1950. This has become an iconic image of the east coast. A chair lift brought people to the summit. It’s long gone, though the cross remains. Top Irish showbands such as the Royal and Miami played the Arcadia ballroom on Adelaide Road in the late fifties and throughout the sixties. Ardmore Studios were opened in the early sixties, bringing a touch of silver screen glamour to Bray. The studios, on Herbert Road, hosted major American and British productions, the industry grew to provide television and advertising facilities. 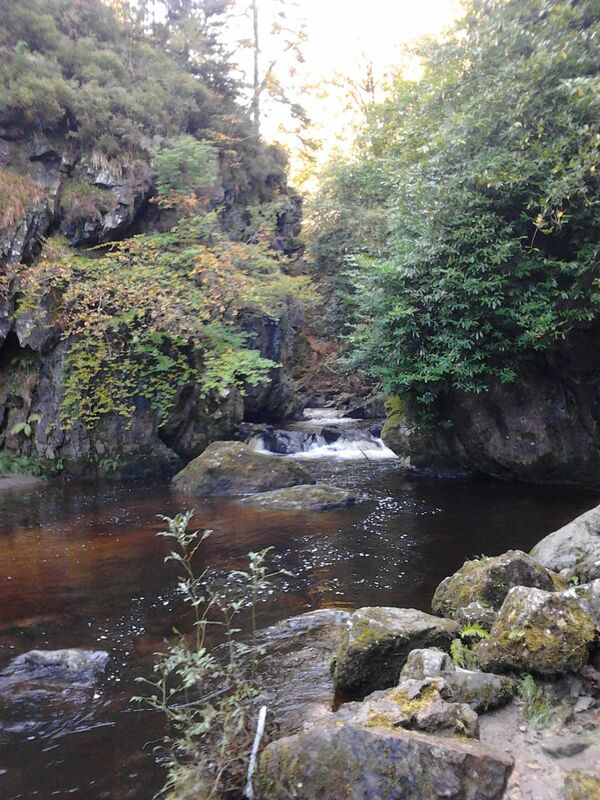 While Wicklow’s lovely scenery was a big draw for producers, Bray’s versatility also came into play. Over the years, the town has stood in for smalltown Vermont, a typical Irish western town or the heart of the English Home Counties on the large and small screens. Neil Jordan painted the seafront pink for The Miracle, he also used it for Dublin in the film Michael Collins, the Carlisle Grounds standing in for Croke Park during the War of Independence. Changing fashions saw the postwar tourist boom fade too. Foreign destinations became a bigger attraction for summer holidays. Tourism was further eroded by the oil crisis and recession of the seventies. Bray experienced an unfortunate depredation of many of its attractions and landmarks. The Internatinal Hotel was destroyed by fire in 1974. The vacant lot festered for a decade or more, eventually taken by a bowling alley. The Arcadia became a cash and carry. In 1980, the Turkish Baths were demolished in the crass, shortsighted civic vandalism that prevailed. There was light at the end of the tunnel, and it was an oncoming train. The electrification of the suburban rail system initiated the Dartline in 1982. Bray Daly station was once more a key focus of the town. In the 1990s, a project sponsored by Bray Community Arts Group, commissioned a painted mural on the eastern platform. The mural depicted the history of the town and the railway decade by decade from the 1950s to the present day. Brunel, Dargan, Oscar Wilde and James Joyce are all featured. Wilde’s father had property in Bray and the writer was to suffer an early, unfortunate trial at the Courthouse. James Joyce has a stronger association. He lived at Martello Terrace, hard by the waves pounding the Promenade. The house features in Portrait of the Artist, while the phrase, “snot-green, scrotum-tightening sea” may owe something to the location. The mural has been badly weathered by the briny air, so original artists, Triskill Design, have undertaken a replacement project using tile mosaics. The rejuvenation of the railway brought a population boom to Bray. By the end of the century the population had doubled to over thirty thousand people. The new residents were housed, for the most part, in suburban estates south of the town. New schools and industry followed. 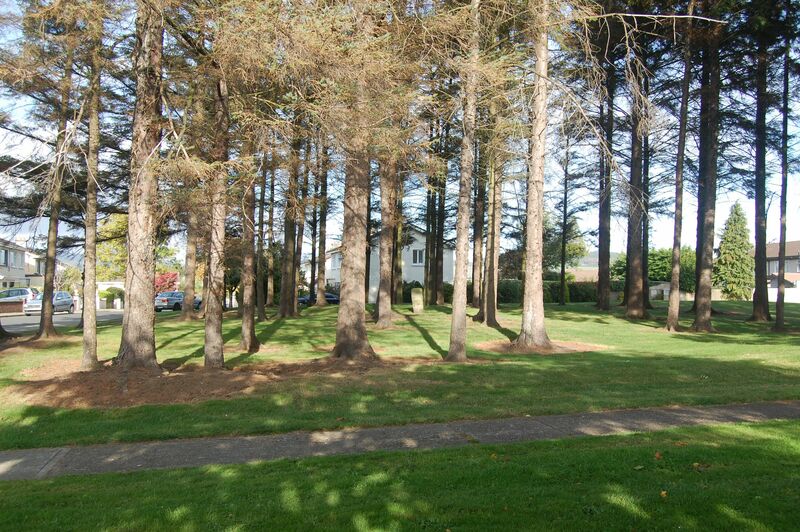 The protection of the sylvan setting has helped soften the impact of such an extensive building development. Still it grows, and new estates and roads now crowd to the edge of the lands of the Kilruddery estate. If the amusement arcades have waned, the seafront remains a magnet for all those seeking rest and recreation. Bars and restaurants now cater to the fashion of al fresco drinking and dining throughout the summer. The annual festival has hugely expanded its carnival attractions, drawing thousands over the St Patrick’s day festival and the Summer Festival throughout July and August. The Fireworks display and the Air-show have seen crowds approaching a hundred thousand throng the length of the Esplanade. Returning Olympic hero, boxing gold medallist Katie Taylor, drew a massive crowd of wellwishers to the Esplanade in 2012. For fitness fiends and boulevardiers, the amenity of the seafront Promenade and Bray Head is popular year round. The National Sealife Centre, north of the Bandstand, is one of Ireland’s most popular visitor attractions. An unimpressive pile at its inception, it has developed into a sleek modernist building, with restaurant, ice-cream parlours and cafes, augmenting the wet zoo at its core. The Civic Centre at St Cronin’s, off Main Street, was a major project of the late century. 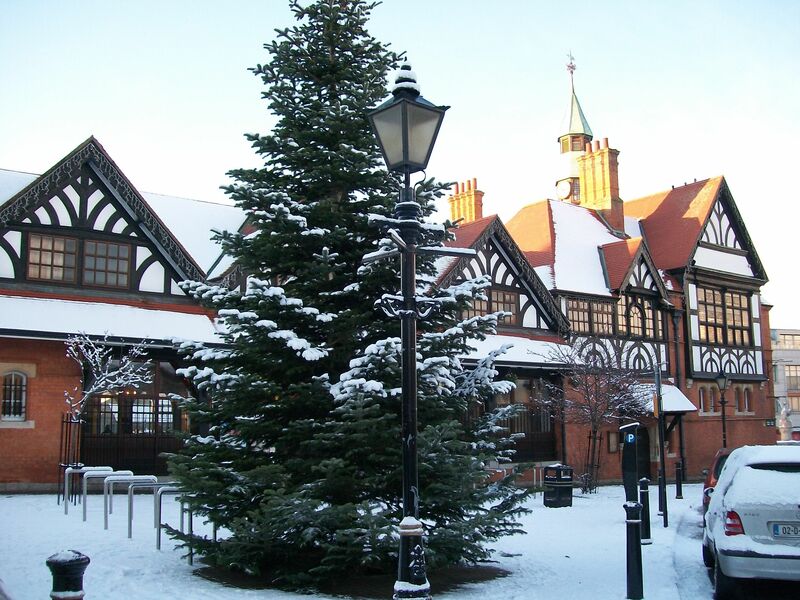 This included the Civic Offices and the Mermaid Arts Centre, incorporating a gallery, theatre and workshop space for several arts disciplines. The Mermaid brought to fruition a long campaign to establish a designated arts centre from artists and groups including Signal Arts and the Bray Arts Group. The Centre is an important focus for the arts in Bray, however the arts scene thrives at several venues around the town, with music, theatre and literature particularly strong. The Bray Jazz Festival in early May is in its fourteenth year, bringing top national and international musicians to a dozen or so stages from Main Street to the Seafront. The financial collapse of 2008 stymied commercial growth in the town centre. Proposed shopping centres, north and south of the bridge, failed to materialise. Town centre businesses in Bray, as elsewhere throughout Ireland, are on the retreat as out of town retail parks and on-line shopping erode their customer base. Bray also lost its town council, it being subsumed into Wicklow County Council. Whether this will prove unsympathetic to Bray’s future needs remains to be seen. Dargle Valley, Bray to Enniskerry. This walk takes you from Bray’s southern suburbs into the leafy wilds of the Dargle river valley, to finish in the majestic parkland of the Powerscourt Demesne. There’s a great variety of scenery throughout, some quirky spots of interest, all packed into an hour and a bit over gently undulating terrain. A round trip takes twice that, and whatever you want for a half way stop. Public transport is available between Bray and Enniskerry, if a one way trip is enough. Bray Town Hall makes a good start point. The building, from 1881, is in the Tudor revival style. It hosts the chambers of the Bray Town Council upstairs, downstairs is a MacDonalds. Taking the right hand fork, Killarney Road winds upwards through tree-lined suburbia. At Fairyhill, less than a mile on, a mysterious copse of trees conceals an ancient stone cross. This is attributed to St. Saran, a student of St Kevin of Glendalough. He gives his name to the road, which is Cill Sarain (Saran’s church) in Gaelic. The vista opens up at the crest of the hill, with a wonderful view of the Great Sugar Loaf and the Wicklow Mountains beyond. Take a right at the lights, down a short suburban lane. At the junction the route goes to the left. Ardmore studios, the home of Irish film is off to the right. Films from The Blue Max to Excalibur, and tv series the Vikings and Penny Dreadful have been shot here. Bray, with its varied landscape and streetscape, has stood for a variety of locales. So, walking in the environs, it is not unusual to come across nests of vikings, Irish rebels or even futuristic and fantastical beings. In the real world, we continue south to the end of Herbert Road. A few hundred yards on, this drops sharply in hairpin bends towards the motorway. At Richmond Park estate on the left, there’s a short woodland pathway, the sort that small adventurous boys would adore. Rejoining the road briefly, the entrance to the metal bridge is on the right. This impressive span takes you across the N11. On the western side is the confluence of the Dargle and Cookstown rivers. 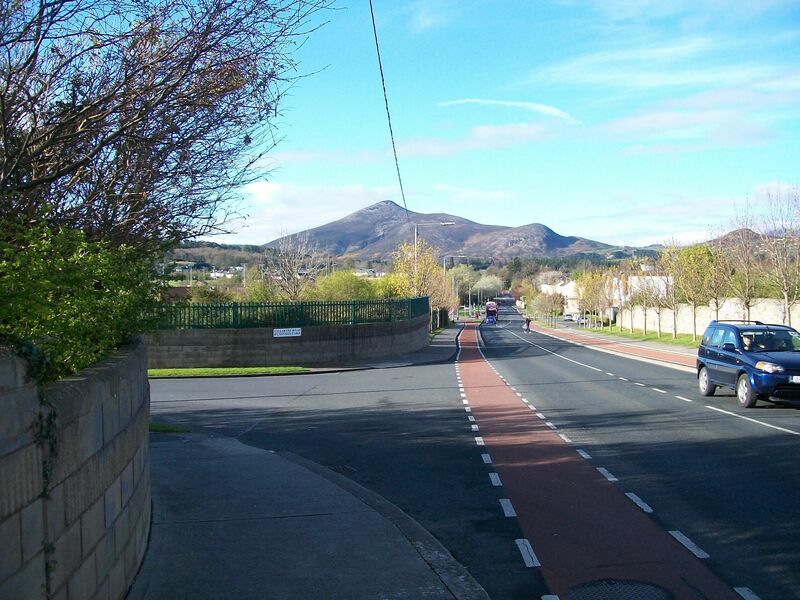 The main road leads directly to Enniskerry, but we take the left hand fork which winds uphill for a few hundred yards. Near the crest of the hill, we spot the entrance into the Dargle valley path. There’s an interesting diversion from the main path where you can take the left hand fork leading down to the river. There’s a delightful pool here at the base of a short fall in the river. Well worth a look and a little time for contemplation, or whatever. Retracing our steps, we rejoin the main path. The journey takes us through rough woodland along a well-beaten path. A mile or so along here, we come to Lover’s Leap, just off the main path on the left. 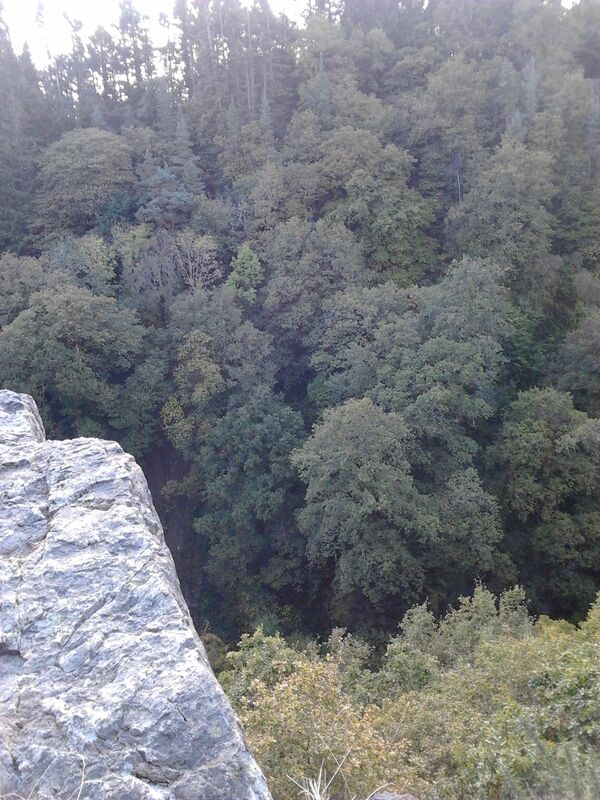 This dizzy outcrop is poised above the thickly wooded glen carved out by the river. It’s a wonderful place to spend some time suspended above the world. Eventually, the path lead onto the road near Enniskerry. Veering to the right, we quickly find the turn for the Powerscourt estate. The entrance road leads through mature beech trees with majestic views to the Sugarloaf mountains to the south. The estate house boasts a garden centre, craft shops and a self-service restaurant. The patio has to-die-for views over the famous gardens to the mountains. Returning to the main road, the picturesque village of Enniskerry is downhill to the left. There are antique shops. coffee shops and a couple of good watering holes, for drink and food. The main road winds back to the motorway along the Cookstown River. There’s a pathway the full distance. Returning to the metal bridge, we can retrace our steps to Bray. or return via Herbert Road. This retains some of its rural character, running parallel to the Dargle which it meets at the bridge below the town, where Bray itself was first formed.